Another things is, if you haven't found me yet, I'm on Ravelry. My user-name is fuzzymitten, and you can find a bunch of my patterns listed under my real name. If you've bought some of my patterns, please add them to your queue or projects. I love seeing what people have knit. Also, I would love to see more ratings of my patterns, so I know which ones people really like, and which ones they don't. If it hasn't been obvious before, I have a terrible time remembering little things. Like I said I would post instructions to make longer horns for the cow? We'll just ignore how long ago that was, and get on with it. Break off yarn, thread end through remaining sts, then secure yarn end. Work 10 rows in garter stitch. Sew the horns to the head just above the ears. Then sew on the extra bit, putting a tiny bit of stuffing under it as you sew it on. 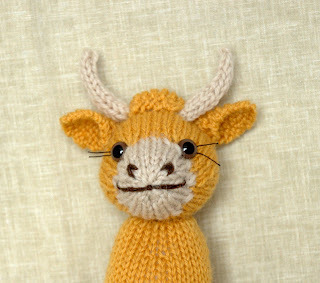 The cow as shown is knit just like the pattern, except I changed colours for the snout. If you were wondering how I got Wayne's nose to be pink when he's knit from white, it's very simple (but might embarrass a big tough guy like him). Use a bit of light pink blush or face power and gently brush it onto the nose until it's the colour you want. The make-up will probably wash off if you wash the toy, but you can just add more powder after washing. Thank you for the extra horn pattern! !I like all your patterns and do comment and heart your pics on Ravelry! !Sometimes on Flickr too! Keep up the good work! March 3, 2008 at 3:21 p.m.
cool idea about the blush! March 3, 2008 at 10:02 p.m.